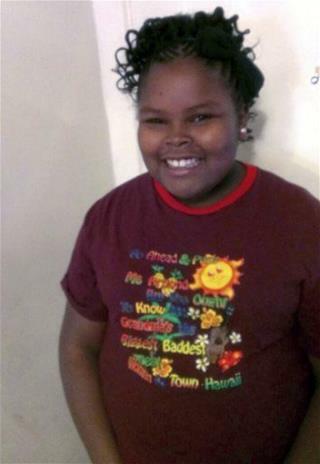 (Newser) – Jahi McMath's family insists that the girl who has been declared brain-dead is very much alive. "She definitely knows where she is and that we're present," uncle Omari Sealy tells the San Francisco Chronicle. He says the 13-year-old remains unconscious but turns in the direction of visitors to her room at an undisclosed rehab facility. Sealy says her skin "looks better than mine," despite predictions that she would quickly deteriorate. No medical professional corroborates Sealy's claims, and the Chronicle points out that movement by brain-dead people can be the result of muscle reflexes. I'm not trying to be rude or anything but I think that this family should be sued for taking up news space. This girl has been brain dead for over a month now and after she was pronounced brain dead, they want to keep the story going. Quite frankly, i'm tired of hearing about it. It's sad but it's time for the family to seriously let her rest in peace. I don't understand why they haven't done simple brain dimension measurements. If the brain is dead it will shrink. If it is shrinking then they need to let go because she is not coming back. What this poor, uneducated family does not understand is that dead people can be kept on life support that keeps their organs functioning. A heart beat doesn't mean she's alive. Muscle movements and nerve reflexes don't mean she's alive. All it means is that the machines are still turned on. And, it is my understanding that as the organs begin to shut down and decomposition gets further along, the body will continue to bloat, stiffen, and become more rigid which will increase the amount of movement. Everything they have said is in perfect keeping with a dead body on machines to keep them breathing. Any notion that she is responding to them or her surroundings is mere delusion and wishful thinking.